Regency on Beachwalk #86 - Heart of Waikiki With Partial Ocean View! Friday Night Fireworks! Washlet! 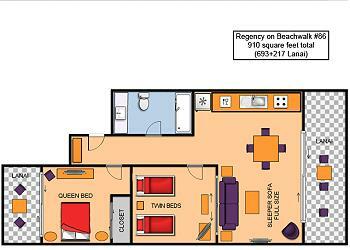 You'll appreciate the comfort and convenience of this modern, fully-furnished two-bedroom, one-bath end unit (693 sq. ft. plus two lanais with tables and chairs, for a total of 910 sq. ft.) at the Regency on Beachwalk! 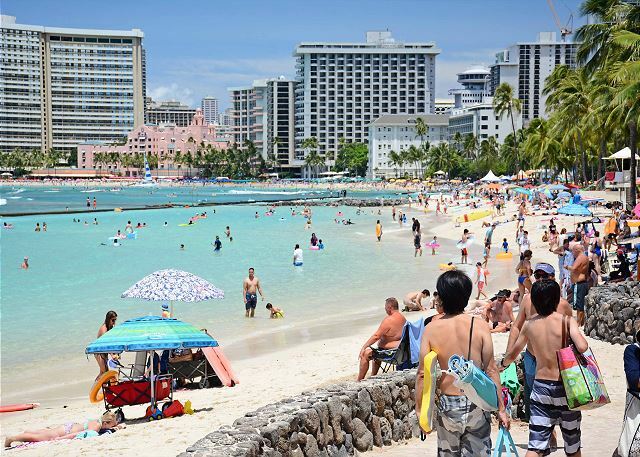 Partial ocean view and right in the heart of Waikiki, just steps from the best beaches, fun outdoor activities, top restaurants, night life, unparalleled shopping at Waikiki Beach Walk! - Large lanai with table and chairs. You'll have a front row seat for Friday night fireworks! The Regency on Beachwalk is a secure building just a few minutes walk to great restaurants like Roy's, Ruth's Chris, Hard Rock Cafe, great night life, great surfing and fun in the sun! This non-smoking accommodation sleeps 6. Our stay here was wonderful. Great location, super close to a lot of attractions. What would have made the stay even better would have been if the condo provided some basic condiments (salt/pepper, oil etc). A couple more rolls of paper towels would have been great also. The balcony was by far my favorite to enjoy a cup of coffee! Mahalo, for the lovely review! We appreciate the feedback and positive comments of your recent stay. As stated in our FAQ's condiments are not left from guest to guest due to spoilage, and hygienic reasons. Most of our units are close to convenience stores, just ask your property manager at check in where you can pick up these types of items for your stay. We're so glad you enjoyed your stay and pleased that you took advantage of the balcony of this fabulous condo! We look forward to seeing you on your next visit! The location was great and we loved the balcony. The rental was very clean and fir our family of 5 nicely. We stayed for 9 days so it would have been nice to have a washing machine and dryer in the unit. The hotel has two for their guests that you can use but it does cost about $8.00 all in quarters. Overall though we had a great vacation and would stay here again. Mahalo for the great review, Amy! So glad to hear you and your family enjoyed your Holiday in this great condo! We look forward to your next visit! the interior also beautiful and you have everything you need for your stay. We loved our recent stay in Hawaii at the Regency on Beachwalk. The location was great, the apartment was clean, quiet, well equipped and comfortable for the 5 of us. Check in and checkout was smooth and no hassle. There was parking available which was a bonus. We would highly recommend this apartment through Captain Cook to anybody looking to visit Waikiki. A fantastic location so close to the beach and shopping. Awesome apartment with modern feel and super ocean views. Our family and especially our two youngsters loved the apartment, service and comfort of this awesome Waikiki base! Aloha and mahalo for taking the time to post a review and recommendation of this fabulous condo. We're delighted you and your family enjoyed your stay! It makes our day to know our dedicated staff was able to make your vacation from start to finish a wonderful experience. We look forward to welcoming you back in the near future. Near the beach,main street,parking,and gelato shop.The condo has everything we need. 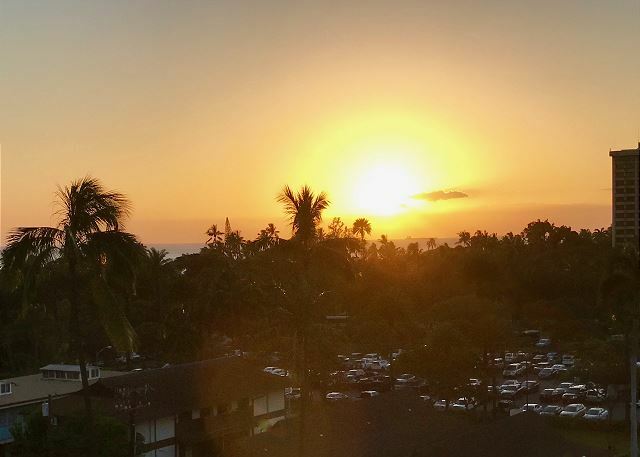 I cooked dinner for my kids and ate at the lanai watching beautiful sunset,and Hilton’s was so amazing! The manager is kind. His Japanese is good. Mahalo for choosing to stay with Captain Cook Resorts and the great review and recommendation! We're so glad your visit was enjoyable and you enjoyed the full kitchen to prepare family meals and enjoy on your beautiful lanai. We look forward to seeing you again! Location and view from lanai was very good. Suddenly water leaked from A/C in main bed room, but property manager fix it accordingly. Lace curtains and cloth of sofa in living are old enough to be replaced. I could not sleep well because of noise from street, and especially garbage collection vehicle every morning at 5:30am. Overall we enjoyed our stay. Mahalo, for sharing your comments about your recent stay. We are pleased that you enjoyed your stay and appreciated the views and convenient location of this wonderful condo! I was very unhappy to hear of the issue you had with the A/C. We are glad that you notified us immediately, and your property manager was able to repair it during your stay. Thank you for your feedback I will pass it on to the team! Hope you can enjoy a return trip to our beautiful islands soon! Very clean, well appointed 2 bedroom 1 bath condo in the heart of Waikiki. There are beach umbrella, beach chairs and board. The kitchenette is well equipped for the purpose of a beach vacation. The condo is in a hotel. The laundry is not in the condo but in the same building. The laundry hours is 9am to 9pm. The restaurants next door seem to be full every time we walk by. Mahalo, for the wonderful 5 star review and recommendation! 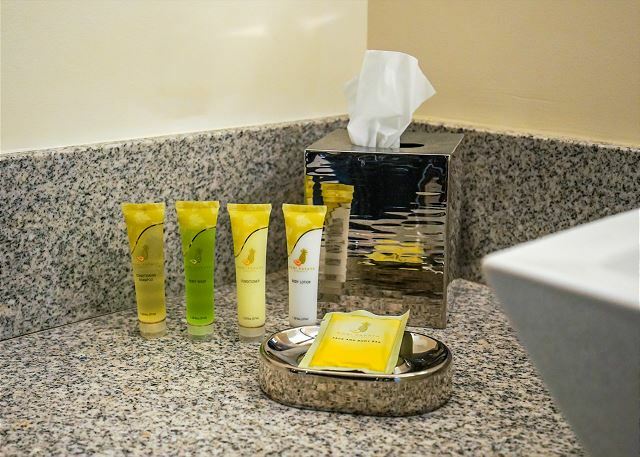 We're delighted to have provided all of the needs you required for an enjoyable stay! It makes our day to read such an enthusiastic review and we're so glad that you appreciated the convenient location of the fabulous modern condo! I will pass your feedback on to the team. We look forward to your next visit! This condo was fabulous! Absolutely nothing negative to say. 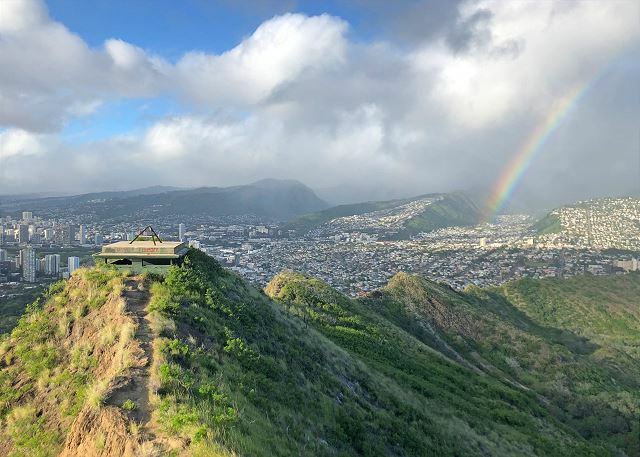 Location was great - tonkatsu restaurant below was our favorite dinner on Oahu. Highly recommend. Mahalo for the very positive comments and recommendation! We look forward to seeing you on your next visit! 3-day stay with total of 6 adults. Location was great, and off-site parking was fine. Bidet was new to us, and a fun conversation item. Beds were quite good except for the hide-a-couch, which was VERY uncomfortable. Do not consider this a sleeping area. The mattress was paper thin and the support bars were running through the backs of the unlucky young adults that drew the short straw. Place was very clean and everything worked well, although we needed instructions (that we did not get) on how to use the AC because we could not figure out the remote. The rooms kept getting hot during the night. Kitchen items were pretty sparse - could really use just salt, pepper, sugar, but we had to buy them all. Considering everything I would certainly stay here again, just not with more than 4 people. We sincerely thank you for providing detailed comments about your recent stay We are delighted your stay was enjoyable and you appreciated the location of this great condo! We apologize that you found the pull out sofa uncomfortable. (UPDATE: As of 7/8/18, the sofa bed mechanism has been replaced and the bed is good as new!) A quick call to your property manager would have resolved the issues with the A/C right away. We can provide foam mattress pads and additional kitchen items if needed. Please remember, our property managers work 7 days a week to see to any issues that may arise during your stay Again, we appreciate your feedback and will pass it on to our Team. We hope to see you on your next visit. Overall, this was a lovely condo. Very cute with enough room for the five of us who stayed in the room. They were very accommodating and allowed us to stay in the condo later since we had a late flight leaving. Also, the condo had boogie boards, chairs and an umbrella that we were able to use which was very nice and saved us from having to buy those things. The location was wonderful, as we were about a five minute walk to the beach, and then a five minute walk to the Main Street with all the shopping and restaurants. A huge bonus to this condo was that we had a free parking spot for our rental car, which allowed us to rent a vehicle for the whole ten days we were there. Nice place, good location, would stay here again. My experience was so amazing! From the beautiful scenery, locals, food and entertainment it was just perfect. My home away from home home was so perfect for my family and I. Great amount of space, just a block from the beach and seconds away from shopping, food and fun. The room was very clean, everything you needed was included. The view to the fireworks on Friday night was a extra perk. We will be back! Thank you to Paul! Mahalo, for the wonderful 5 star review and recommendation! We're thrilled to read your review and know that we provided all of the needs you required for a Paradise Vacation! 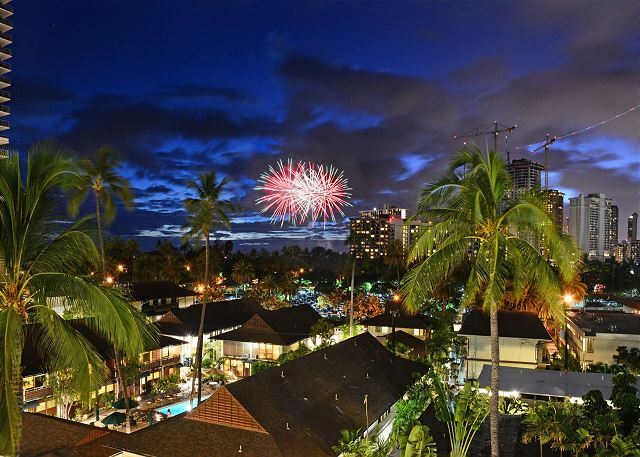 We are so glad you were able to view the Friday night Fireworks from this fabulous condo! We at Captain Cook Resorts thank you and hope you can enjoy a return trip to our beautiful islands soon! Aloha! Thanks so much for leaving such a great review. 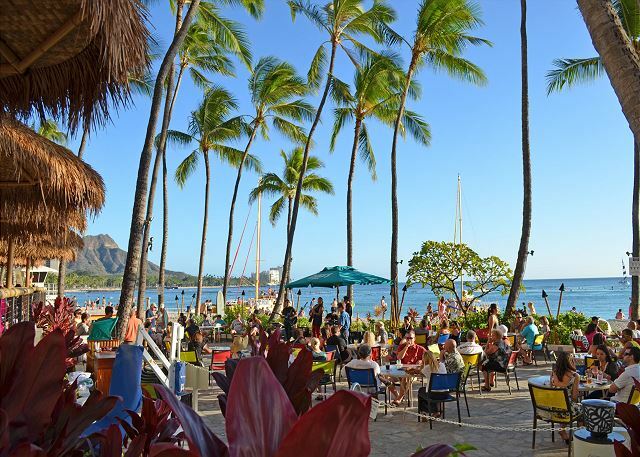 We are delighted you enjoyed your stay and appreciated the convenient location, just steps away to all the fun experiences in Waikiki! We will pass your positive feedback on to our team and look forward to seeing you on your next visit! This was perfect for us with our 8 month old. He was able to have his own room to sleep during the day whilst still having a lounge to hang out in. The extra space for him to crawl around was perfect. Great family spot. The condo is tidy, towels & linen provided. The food trucks across the road were super yummy, easy walking distance to everything on the main drag of Waikiki. The only draw back is not being able to use the outrigger facilities which we understand is due to different management and liabilities. It makes our day to read such an enthusiastic review, Mahalo! We're so glad you enjoyed your stay and we met your needs for a wonderful family vacation! We are happy you took advantage of the food trucks and location of this fabulous condo! Hope you can enjoy a return trip to our beautiful islands soon! Fantastic condo and makes the vacation perfect. Pleasant experience of staying for vacation. The condo is clean, and has everything we need, including plenty of towels. Very comfortable to stay. Nice location which is close to beach, and with excellent restaurants nearby. Able to see beautiful fireworks on balcony on Friday. Paul Tucker is a very friendly and helpful manager. Terrific experience of staying here. We shall come back next time. a great place to stay in a great location. close to shops, beach and amenities. Mahalo, for the wonderful review! We are so glad your stay was enjoyable and that you appreciated the location of this great condo. Hope you are able to plan a return trip soon! Perfect location. Clean - everything we needed. The location was at the end of Waikiki but it's still verify close to everything (beach, shopping, & restaurants). The place itself was very nice and neat. The living room and kitchen is upgraded. One of my favorite thing was the balcony with the (partial) view of the ocean. I spent most of the morning and evening hanging out there with my travel companions. The property manager was very friendly and personable. The staff in general was very responsive and friendly. Would I stay here again...? YES absolutely! Mahalo, Amy, for the lovely review! We're so glad you enjoyed your stay and pleased that you took advantage of the balcony and ocean views of this fabulous condo! We look forward to seeing you on your next visit! The condo was wonderful. The view was amazing & the location was perfect. The beds were comfortable; the condo was very nice, just like the picture. Mahalo, Darla! We appreciate the feedback! Come back and visit us again! Checks all the right boxes. Best unit I've stayed in. Where do I begin. First, the photos do not do it justice. The unit is actually quite large by Waikiki standards. 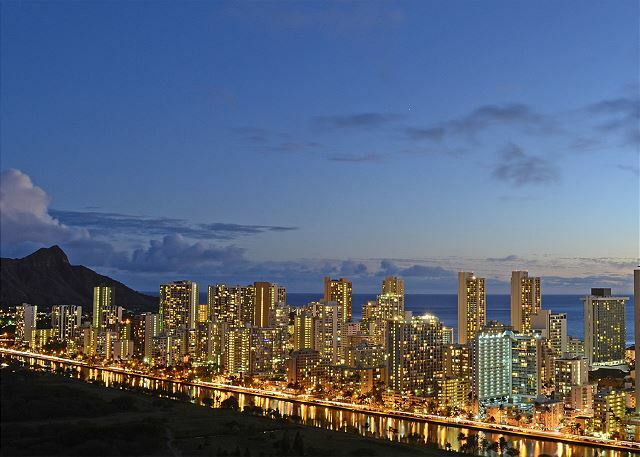 I've stayed in quite a few Hotels & condos through the years visiting Waikiki and seeing the size, location and the view is impressive. There are two lanais (balcony's) one for a bedroom and the other off the living room. There is a secondary bedroom right off the living room with sliding panels that afford the user view of the huge view. I actually would think this is the master bedroom if it wasn't for the two twin beds. Both have a flat screen TV in them as well as the living room. The unit has a full kitchen with a cook-top in place of an oven. This helps for those that need to eat in on bad weather days, but 9 out of 10, most won't need to and will eat out in one of the nearest food establishments. The bath has a walk in shower and the toilet has a Toto Bidet. Location Location Location as the saying goes and this unit is in one of the ideal spots. Plenty of shops from budget conscious to extravagant within a 4 block radius. The owner Mike is quick with responses before we rented and the manager of the unit Paul is easily accessible for questions once we arrived. Parking is provided over (1 short block away) in Fort DeRussy park and can be reached even faster by going through the Trump Int'l Hotel. They have a Android and Apple app. 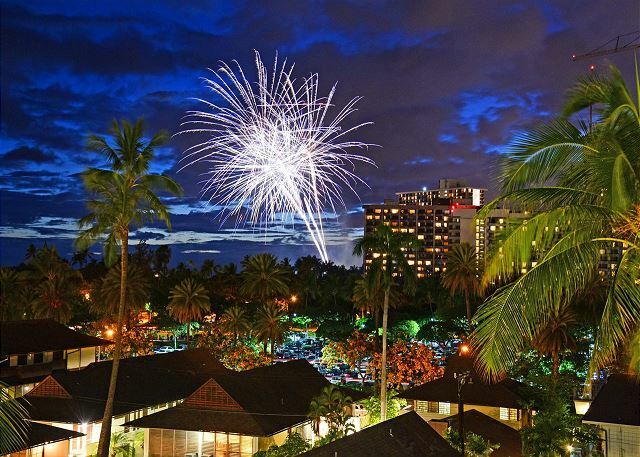 if your stay includes a Friday night, I highly recommend staying in between 8:30 and 9:00 PM on Friday for the fireworks show provided by the Hilton . The view off the lanai is amazing. There are a few food trucks out front next to the Trump Hotel and the fish tacos are the best I've tasted. There really isn't any except I wanted the twin beds pushed together as one bed and it wasn't done. No big deal. Mahalo, David for sending such a wonderfully detailed 5 star review! It makes our day to read such enthusiastic comments. Happy to have provided all of the needs you required for your vacation! It's what we're here for! Hope you can enjoy a return trip to our beautiful islands soon! It was easy to reach Paul who greeted us and he was very friendly and a warmful manager. I would stay here next time to be Honolulu. 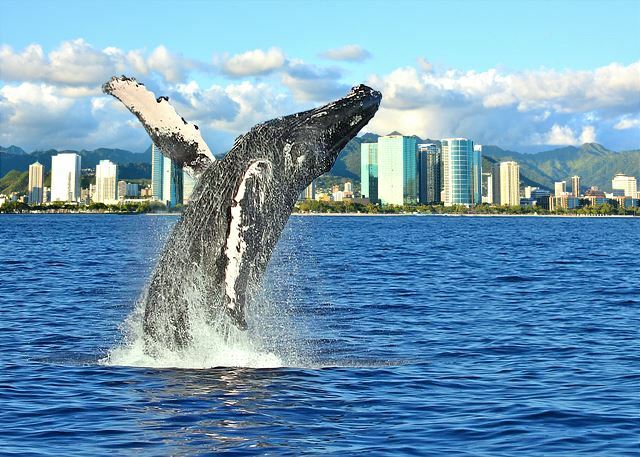 Mahalo, Hiroki we are happy to hear you enjoyed your stay, and appreciated the great location of his wonderful condo - we are dedicated to offering great accommodations and service, and we're so glad your visit was enjoyable. We had a excellent time! The location is the best. The room is clean and enough widely for five families. The telephone of the room was not usable, but we were able to borrow it in a lobby. Aloha Yuki and thank you for sharing your comments about your recent stay. We apologize for the problems you encountered with the telephone. Thanks for alerting us to this. We will pass this info on to the property manager for resolution. During your next visit, should you encounter any problem, we hope you will allow your property manager to resolve any issue during your stay. They are on call for you 24/7. This is our first time staying at a vacation rental and this place is just perfect. The location is very convenient, close to the main shopping area as well as the beach. Plenty of good restaurants are nearby. The delicious Tonkatsu Ginza Bairn is just downstairs. We have a 5 month old traveling with us, and they were very kind to provide us with a complimentary crib. From the spacious balcony, we can also see the Friday night fireworks, which is a nice surprise. 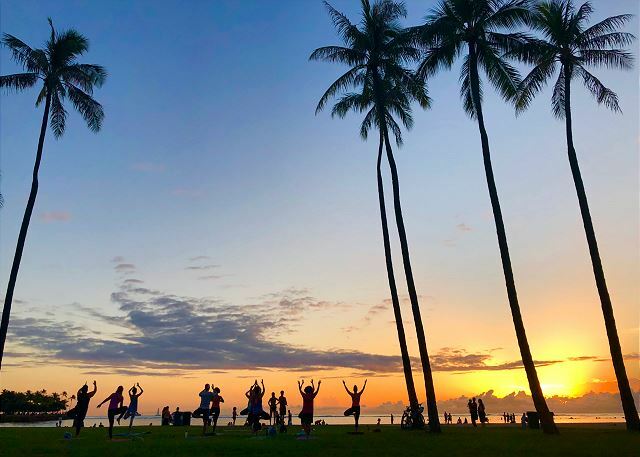 Mahalo for the 5-star review, Min! So glad to hear you enjoyed your stay in this great condo! We look forward to your next visit! The apartment was perfect for 2 friends on a shopping jaunt from Australia. 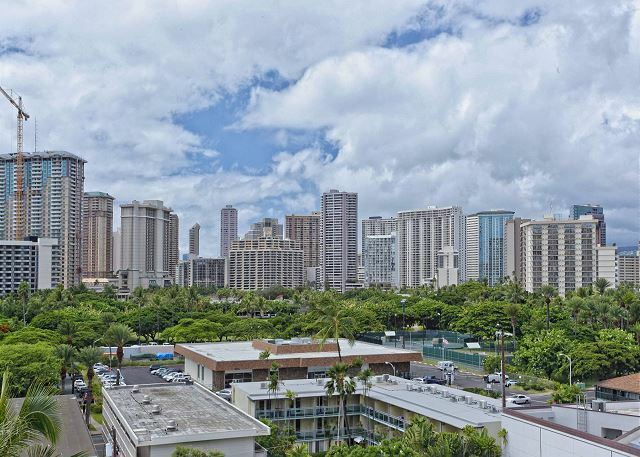 The location is very convenient to everything in Waikiki and short walks to catch shuttles and buses to venture further. The apartment was very clean and had everything we needed, including beach towels and a fully stocked kitchen. We ate breakfast on the balcony everyday which is private and has fabulous views. Its a little bit noisy from early-morning rubbish trucks so I recommend earplugs for sleeping. Paul from Captain Cook Real estate was great. When we asked about a fan for the second bedroom, he produced a brand new one within a couple of hours and set it up for us. Paul mentioned that they plan to install ceiling fans soon. They aircon in the lounge and main bedroom was very good, and very welcome after a hot day of shopping! Overall I would recommend this apartment to a couple of friends sharing or a couple who just want some extra space. Mahalo, Narelle, for taking the time to share your recent experience at Regency on the Beach #86! It's always great to get this kind of feedback - we're so glad you enjoyed your stay! We will pass your feedback on to your property manager, Paul; he's a real asset to the Captain Cook Resorts team! Overall it was a great experience staying at this location. The room is of good size and very functional. They even have rice cooker in the kitchen and the view of the balcony is breath taking. Everyday I woke up I'll sit at the balcony and look at the view. The location is great. There is an ABC store and a 7/11 right downstairs. A food truck area and Japanese fruit shop just steps away. the only downside is the free parking - you need to walk 3 minutes to get to the parking lot( we found a short cut that you can walk through the loading area of the Trump hotel). Beach is 5 minutes walk away too. 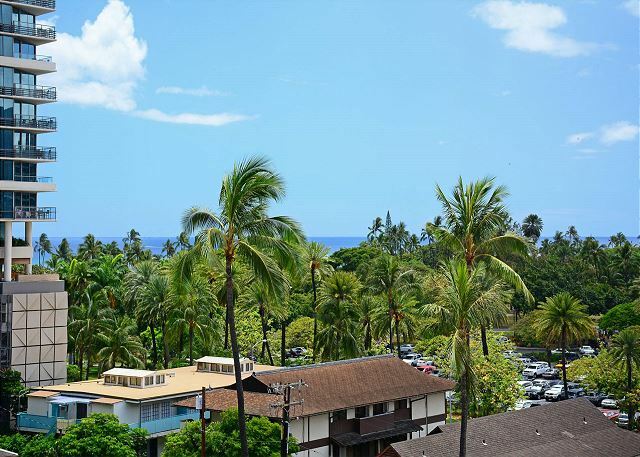 Mahalo, for taking the time to share your recent experience at Regency on Beachwalk #86! It's always great to get this kind of feedback. 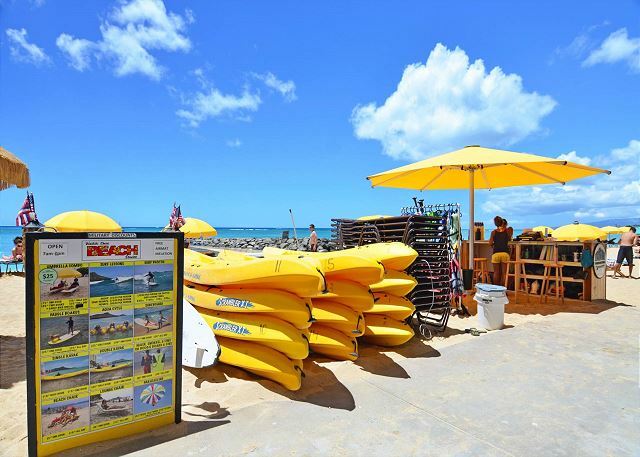 Parking in Waikiki is at a premium and we are very pleased that we are able to offer it for our guests. We are dedicated to offering great accommodations and service, and we're so glad your visit was enjoyable.